Food. One can’t very well have an integrated approach to happiness without considering what we put in our bodies. It’s a big topic. There’s a lot to ponder. I’m particularly pleased to note that some of my favorites — coffee, blue or red skinned potatoes, tomatoes, and garlic — all made the list! So what we eat affects how happy we feel — simultaneously, how happy we feel affects what we eat. Three days after Dave brought the happiness diet to my attention, the Happiness Initiative posted a link to a happiness weight loss video from an annual conference in Australia. The sound quality of this video is challenging, but if you can hang in there, Professor Tim Sharp — Chief Happiness Officer of the Happiness Institute in Sydney — explains how to use the “primacy of positivity to achieve a healthier weight.” Makes sense. An integrated happiness approach also means making the connection between how our eating choices affect the rest of the planet. For me, that means choosing vegetarian options roughly 95% of the time to help stem climate change. There are many, many other issues — from fair trade coffee to the rights of immigrants on our dairy farms. I want to highlight just one wonderful way to eat fresh, organic, and local — very local — even in the depths of winter. 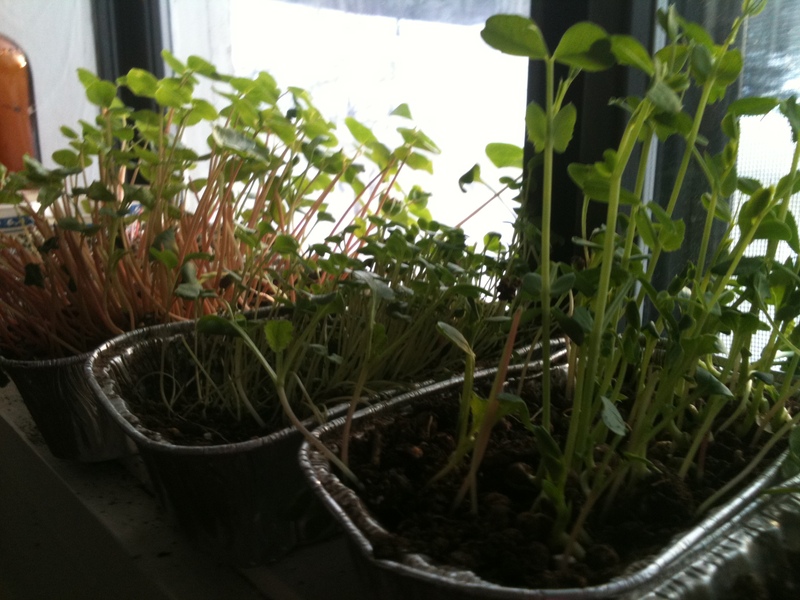 Thanks to Peter Burke and his workshops at the Hunger Mountain Coop in Montpelier, my husband Bob now grows a variety of nutritious and tasty sprouts all winter long. I love watching this little garden grow on the window sill, with snow and ice on the other side of the glass. What a treasure! Who we eat with can also build our happiness levels. When I worked at Home Share Now as staff mediator, I grew to appreciate how lonely it can be to eat alone, and what a relief it was for folks in a new home share match to once again have someone with whom to share meals. Food is a connector, dining is a relationship builder. Food also provides an opportunity for a sustained gratitude practice. Years ago, Bob and I began lighting candles at dinner every night, even in the summer when it doesn’t get dark till 10 PM. At each dinner, we toast someone or something — an idea, the weather, happy news, a person in pain … We didn’t consciously establish this ritual, much less set out to do a nightly gratitude practice. But that’s how it’s evolved. Now, when I think about our winter toasts next to the wood stove, or the summer toasts on our screened porch, and the smiles or sadness we share as our glasses touch, and the simple food we’re about to enjoy (almost always with his home grown garlic), it fills me with contentment, joy, and gratitude. In other words, happiness. Whoohoo! I’m eating lots of happy foods! But, it’s also the breaking bread with family and friends that represents a true rite of happiness. Yes, sometimes it may seem overwhelming, but the some of the best and most “Happiness” inducing memories I have are those from around a table. Whether it’s a solo effort, or a collaboration, the experience of sharing a meal with a good side of conversation is, in my book, a very good thing. I think it’s good to pause sometimes and appreciate the simple things — breaking bread with family and friends — that make us happy! Yay, Ginny. This is great.